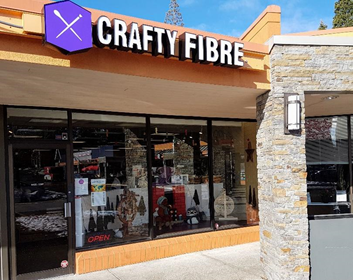 Crafty Fibre (formerly known as Crafty Creations) is a family owned and operated yarn shop in the Sunshine Hills neighbourhood of North Delta. We have supplies and classes for knitting, crochet, spinning, weaving, and felting. With a large selection of hand dyed yarns and fibre, mostly from Canadian independent businesses, as well as spinning and weaving equipment from Ashford and Schacht, Crafty Fibre has something for every fibre enthusiast! During the crawl, all regular-priced yarn and fibre will be 15% off. There will be an in-store prize basket giveaway and goodies for everyone who stops by. If you've participated in the last three crawls, you will already be familiar with the work of Brenda Brayfield, our wonderful knitting instructor. This year, she has another all-new shawl pattern she's generously giving away to everyone who makes a purchase at Crafty Fibre during the crawl. The pattern is a two-colour design featuring yarn from Crafty Jak’s Boutique. Be sure to stop by for your free copy! Join us on Saturday, April 27 as we welcome Katrina of Crafty Jak’s Boutique back for a trunk show! She’ll be in the shop all day with her beautiful palette of colours on both yarn and fibre! Join us for Knit Night on Friday from 5-8pm. Yarn Crawl Hours: Friday: 10am – 8pm; Saturday: 10am – 5pm; Sunday: 12pm - 5pm.